When it comes to washing our hair, we either do an oil/conditioner treatment prior to shampooing (i.e., pre-poo) or we use conditioner as a shampoo substitute (i.e., co-wash). Why? Because pre-pooing and co-washing help us to avoid the drying effects of shampoo, which can lead to brittle, breaking hair. Additionally, certain pre-poo treatments, like coconut oil, can strengthen the hair and minimize hygral fatigue (i.e., stress on the hair due to water uptake and eventual evaporation). Those of us who do use shampoos generally go for sulfate-free ones, which can further decrease any drying effects. However, even with sulfate-free shampoos, many of us still pre-poo for added protection. 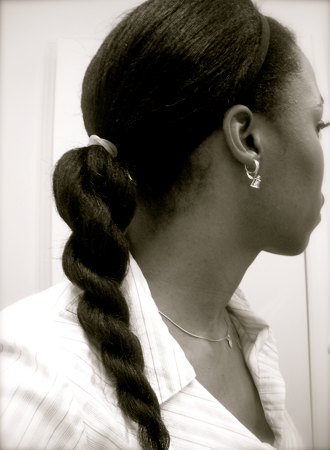 Many long-haired naturals go a year (yes, a year) between trims while a few go six months at the minimum. Some long-haired naturals do not trim at all and just “dust” or do a “search and destroy”. A “dust” involves trimming ¼ inch or less off the ends. Doing a “search and destroy” involves only trimming those strands that have visible split ends. What is the bottom line? Generally, we only trim when our hair absolutely needs it AND we keep our hair fairly healthy so that it does not need one often. When it comes to staple products, we generally love oils and conditioners, and they do not have to be fancy, expensive brands either! Conditioners help to reduce dryness and breakage. Oils either replenish or seal in moisture, depending on the type. Additionally, oils help to minimize knots and tangles, which can be death to our length retention. Some of us long-haired naturals also love to add oils to our conditioners to provide extra slip for detangling. When it comes to detangling, we generally use our fingers and/or a wide-tooth, seamless comb. Those of us who use combs usually do so on conditioner-soaked hair and with the K-cutter or a bone (or resin) comb to avoid snagging and ripping. Those of us who finger detangle do so on wet or dry, lubricated hair depending on what works for us. Whether we detangle with our fingers or a wide-tooth, seamless comb depends heavily on our hair texture, density, type, and styling process. What about the brush and thin-tooth comb? Many of us steer clear of them. Less is more! Keep it simple! And leave your hair alone! I use to co-wash, but I've found using an organic black soap shampoo leaves me hair much softer and my scalp cleaner. That and Terresentials mud wash works awesome for me. I'll never go back to regular shampoo. I'm relaxed and follow the same guidelines. These things have made a tremendous difference in my healthy hair journey. I personally like handmade products but inexpensive conditioners can work as well if you find the right product that meets your hair needs. I know prepoos are all the rage but I don't have the energy to do alladat lol It's enough for me to drag myself to the sink for my regular wash...I can't be adding steps to the process.